Mount Athos has been inhabited since the ancient times and is known for its nearly 1,800-year continuous Christianpresence and its long historical monastic traditions, which date back to at least 800 A.D. and the Byzantine era. 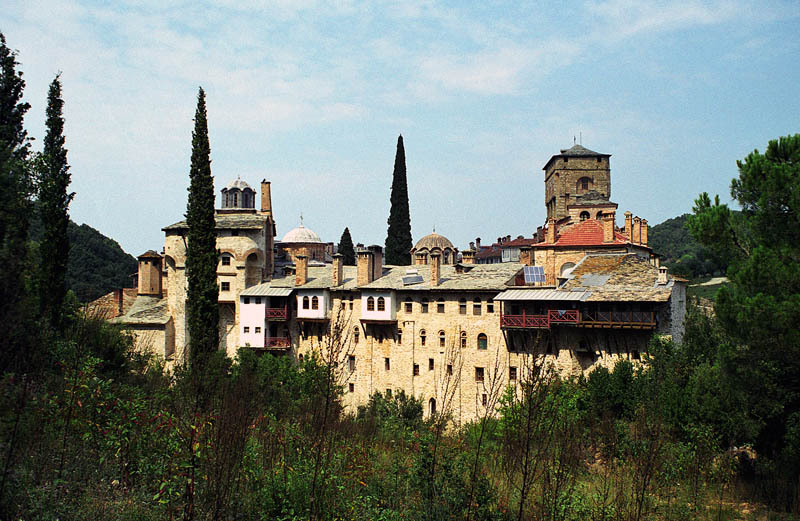 Today, over 2,000 monks from Greece and many other Eastern Orthodox countries, such as Romania, Moldova, Bulgaria,Serbia and Russia, live an ascetic life in Athos, isolated from the rest of the world. 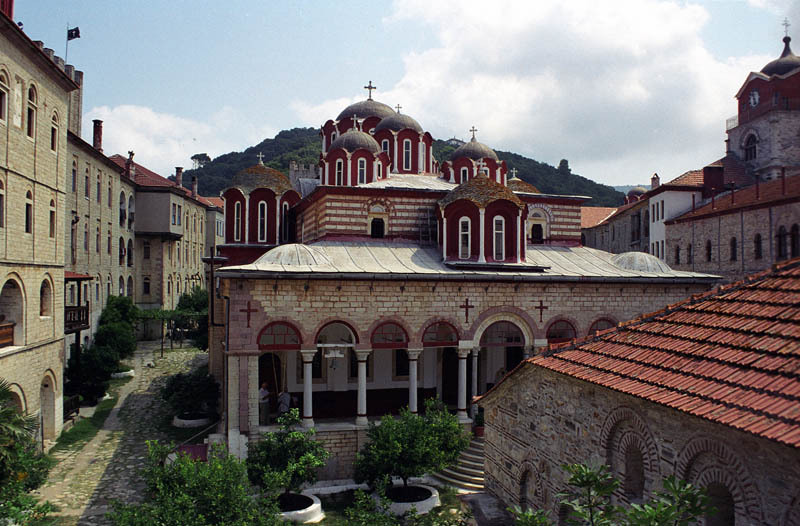 The Athonite monasteries feature a rich collection of well-preserved artifacts, rare books, ancient documents, and artworks of immense historical value. Although Mount Athos is technically part of the European Union like the rest of Greece, the status of the Monastic State of the Holy Mountain, and the jurisdiction of the Athonite institutions, were expressly described and ratified upon admission of Greece to the European Community (precursor to the EU). The free movement of people and goods in its territory is prohibited, unless formal permission is granted by the Monastic State's authorities. The peninsula, the easternmost "leg" of the larger Chalkidiki peninsula in central Macedonia, protrudes 50 kilometres (31 mi) into the Aegean Sea at a width of between 7 and 12 kilometres (4.3 and 7.5 mi) and covers an area of 335.6 square kilometres (129.58 sq mi). The actual Mount Athos has steep, densely forested slopes reaching up to 2,033 metres (6,670 ft). The surrounding seas, especially at the end of the peninsula, can be dangerous. In ancient Greek history two fleet disasters in the area are recorded: In 492 BC Darius, the king of Persia, lost 300 ships under general Mardonius (Herodotus "Histories" book VI (Erato), Aeschylus "The Persians"). In 411 BC the Spartans lost a fleet of 50 ships under admiral Epicleas. (Diodorus Siculus, "Bibliotheca historica" XIII 41, 1–3). 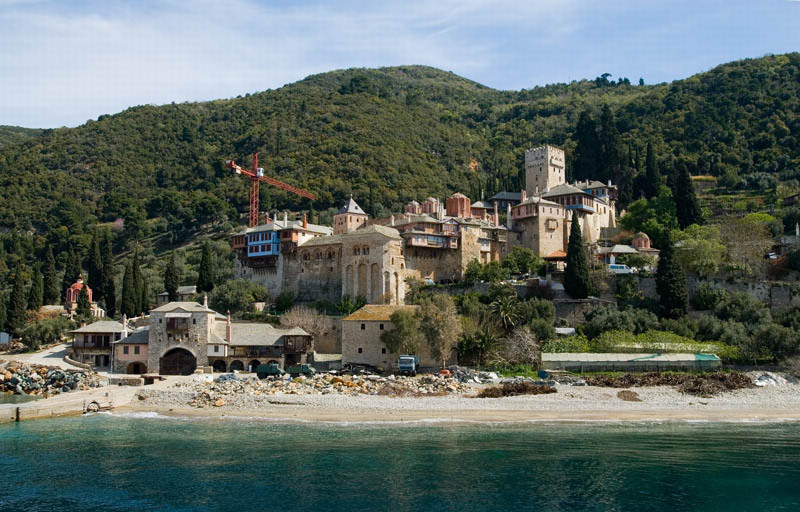 Though land-linked, Mount Athos is practically accessible only by ferry. The Agios Panteleimon and Axion Estin travel daily (weather permitting) between Ouranoupolis and Dafni, with stops at some monasteries on the western coast. There is also a smaller speed boat, the Agia Anna, which travels the same route, but with no intermediate stops. It is possible to travel by ferry to and from Ierissos for direct access to monasteries along the eastern coast. 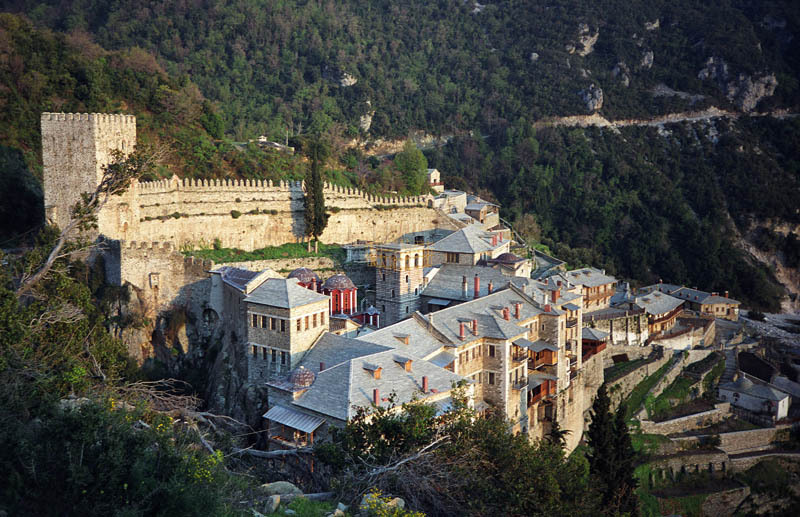 The number of daily visitors to Mount Athos is restricted, and all are required to obtain a special entrance permit valid for a limited period. Only males are permitted to visit the territory, which is called "Garden of Virgin Mary" by the monks, with Orthodox Christians taking precedence in permit issuance procedures. Residents on the peninsula must be males aged 18 and over who are members of the Eastern Orthodox Church, and must be either monks or workers. Athos in Greek mythology is the name of one of the Gigantes that challenged the Greek gods during the Gigantomachia. Athos threw a massive rock against Poseidon which fell in the Aegean sea and became Mount Athos. According to another version of the story, Poseidon used the mountain to bury the defeated giant. Homer mentions the mountain Athos in the Iliad (book 14, 229). Herodotus (VI.44) writes that, during the Persian invasion of Thrace in 492 BC, the fleet of the Persian commander Mardonius was wrecked, with losses of 300 ships and 20,000 men, by a strong North wind while attempting to round the coast near Mount Athos. Herodotus mentions the peninsula, then called Acte or Akte, telling us that Pelasgians from the island of Lemnos populated it and naming five cities thereon, Sane, Cleonae (Kleonai), Thyssos (Thyssus), Olophyxos (Olophyxis), Acrothoï(Akrothoön). (Herodotus, VII:22) Strabo also mentions the city of Dion (Dium) and that Acrothoï is near the crest. (Strabo, Geography, VII:33:1) Eretria also established colonies on Acte. At least one other city was established in the Classical period: Acanthus (Akanthos). Some of these cities minted their own coins.